According to the National Society for Professional Engineers (NPSE), the first professional engineering license was issued to Charles Bellamy in Wyoming on August 8, 1907. Since that time, licensure has expanded and professional engineers across the U.S. have made the commitment to protect the public health, safety, and welfare. NSPE is celebrating licensed professional engineers with the third annual Professional Engineers Day on Wednesday, August 1, 2018. Cordoba Corporation is pleased to raise awareness about what it means to be a PE, recognize licensed PEs, and show appreciation for the work they do each and every day. We are proud of all of our Engineers! Today, on Professional Engineers Day, we are are thrilled to acknowledge a few of our licensed Professional Engineers who are Making a Difference for our clients and communities across the State of California! David Garza has over twenty years of structural design and construction experience ranging from commercial, light industrial, institutional, municipal, healthcare, utilities and residential. David provides a multitude of design options with extensive knowledge in structural steel, reinforced concrete, prestressed concrete, light gauge steel, masonry and wood. He has managed and designed numerous projects using all standard engineering materials and is an industry wide recognized expert using precast/prestressed reinforced concrete in bridge design and commercial construction. David earned his B.S. in Structural Engineering from California State University, Fullerton and he is currently working on completing his M.S. in Structural Engineering at California Polytechnic University, Pomona in fall 2018. 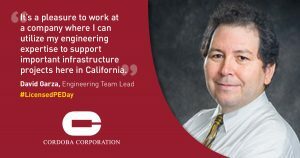 He is affiliated with several industry organizations, including the American Institute of Steel Construction, American Society of Civil Engineers, Precast/Prestressed Concrete Institute, American Iron and Steel Institute, Structural Engineer Association of Southern California, Cold Formed Steel Engineers Institute, and the California Steel Framing Alliance. David is a licensed Civil and Structural Engineer as well as a licensed General contractor in the State of California. Melissa de la Peña has over 20 years of experience in transportation engineering and management of large infrastructure projects in Southern California. 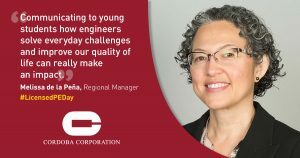 She is a leader in Cordoba’s Transportation Infrastructure sector where she currently serves as the Regional Manager for the Burbank to Los Angeles to Anaheim corridor of the 800-mile statewide California High-Speed Rail Project. She is responsible for the overall management of a multi-disciplinary consultant team consisting of several consulting firms responsible for the planning, public outreach, conceptual and preliminary design, and the preparation of required environmental documentation. Melissa is a Past President of the Los Angeles Chapter of the Women’s Transportation Seminar (WTS-LA). She cites her tenure as WTS-LA President as a transformative opportunity and an excellent learning experience. In December 2017, the California High-Speed Rail Authority honored Melissa with the Excellence in Community Involvement Award for her work with local high schools and mentorship programs, and her continued involvement with introducing the field of engineering and transportation to young students, many from disadvantaged communities. Melissa helped jumpstart the High-Speed Rail Authority’s Southern California Region Educational Outreach Program and she participates with her colleagues in International Trade Education Programs outreach events and mentoring programs. Through these programs, Melissa has participated in STEM events, mentoring and coaching sessions, and Engineer Week events at the LA River School at the Sotomayor Campus, Narbonne High School, and the Girls Academic Leadership Academy, the first all-girls STEM school in Los Angeles. Melissa is licensed Professional Engineer with a B.S. in Civil Engineering from the University of California, Los Angeles. Michael Stanwick provides leadership for Cordoba Corporation’s Transportation Infrastructure sector in Northern California, where Cordoba works with several transit and transportation clients and projects, including the San Francisco Bay Area Rapid Transit District (BART), Santa Clara Valley Transportation Authority (VTA), the California High-Speed Rail Authority, and the Transbay Joint Powers Authority (TJPA). 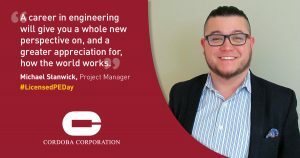 Michael, who is based in the San Francisco Bay Area, is currently providing project management leadership on a variety of projects in the Bay Area, including the Unity Council’s Fruitvale Village Phase II-A/Casa Arabella Project in Oakland. He is an experienced Civil Engineer, having worked for several engineering firms on a variety of rail and highway projects. His experience includes such high-profile projects as the SR-132 Freeway Project in Modesto, where he developed the geometric elements and engineering drawings for this $170 million project. Michael’s previous responsibilities also include preparing track alignment design, reports and plan sets for the California High-Speed Rail Project. 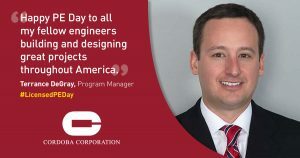 Michael brings unique international experience to our team through a previous assignment for Qatar Rail’s Long Distance Railway Network, where he created preliminary designs for temporary diversion roadways, station access roadways and maintenance facility roadways. Michael is a licensed Professional Engineer with a B.S in Civil Engineering from the University of the Pacific. 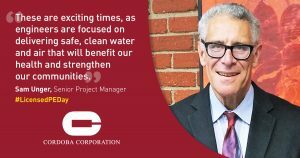 Sam Unger has more than 40 years of experience and leadership in both the public and private sectors in environmental policy, water infrastructure development, and water quality. He is a recognized expert in program and project development, project management and environmental compliance. Sam’s experience includes water and wastewater treatment; site cleanup; development of water quality standards for municipal and industrial stakeholders; and design, construction and start-up of water treatment and storage systems. In addition, he has served both as Design and Project Manager for numerous stormwater capture and treatment projects throughout Southern California. Sam started his career at the Idaho National Research Laboratory developing programs for hazardous waste management and wastewater treatment at a federal energy research laboratory. Later he worked for an engineering consulting firm, where he served as lead engineer and managed contaminated site cleanups throughout the United States. He later served as Principal Engineer and Executive Officer of the Los Angeles Regional Water Quality Control Board. At the Regional Board, Sam managed teams of scientists and engineers in developing plans for holistic management of waters in the Los Angeles Region. He led the Regional Board in developing a watershed approach for restoration of surface waters that emphasize the benefits that a holistic watershed approach can provide. As Executive Officer, Sam was responsible for approval of more than twenty watershed plans to cover most of the watersheds in Los Angeles County including the technical bases for each watershed management plan. Sam earned his M.S. in Chemical Engineering from the University of California, Berkeley and is licensed as a Professional Chemical and Mechanical Engineer in California. Terrance DeGray is currently serving as the Program Director for Cordoba Corporation’s Bond Management Team (BMT) supporting the Long Beach Community College District Bond Construction Program. In this role, Terrance is directly responsible for the oversight of the BMT members and managing the District’s $1.5B capital improvement program (Measure E and Measure LB). Terrance oversees such activities as program planning, financing, project controls, all project design and construction phases, and long-range scheduling for over 30 projects on two campuses. Terrance provides direct oversight of approximately $270M of active Bond Construction projects that are either in design or construction. Such projects include: the Integrated Energy Master Plan; Building M Multidisciplinary Classroom Building (First State Funded Design-Build Project); Pacific Coast Campus Parking Structure (Design-Build); QQ & RR Electrical Technology Building; District Wide Security Monitoring Project; Districtwide Accessibility Assessment and Improvements; Kinesiology Labs and Aquatics Center; Building D Science Lab and Classroom; Building J Auditorium; Building P Language Arts; Building MM Construction Trades One; Building X – Central Plant Expansion; and Building O1 Data Center. Terrance is a Certified Construction Manager and a LEED Accredited Professional with formal education in civil engineering, along with a strong background in leadership and management. Terrance received his B.S. in Civil Engineering from Virginia Military Institute (Tau Beta Phi) and his M.S. in Civil Engineering from Virginia Tech. He is a registered Professional Civil Engineer in the State of Virginia. Earlier this year, Engineering News Record (ENR) recognized Terrance as a Top Young Professional (“Top 20 Under 40”). In addition, through Terrance’s leadership, projects at the District have earned Construction Management Association of America Project Achievement Awards, as well as recognition from the Design-Build Institute of America. Terrance is also recognized throughout the State of California and at the national level with his work on the District’s Integrated Energy Master Plan.